This looks, from the trailer, another great British comedy-horror. With Jamie and Ray Winstone on seemly different sides adds to the plot. 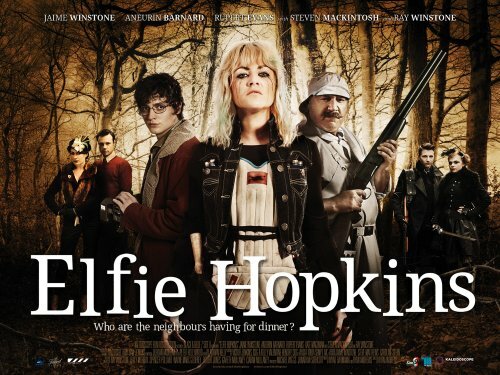 Elfie Hopkins (Jaime Winstone), a 22 year-old animal-loving slacker, stoner, and wannabe detective, lives in a sleepy hunting village. Haunted by the death of her mother, Elfie seeks solace and inspiration from the old school detectives in The Maltese Falcon and Chinatown. She entertains herself, along with her geeky best friend, Dylan, by investigating the villagers and upsetting everyone with their imaginative allegations. Things get serious however with the arrival of a family of trendy city dwellers, the Gammons, who weave seductive tales of adventure and entice the villagers with offers of exotic hunting holidays around the world. Despite not being immune to the Gammons’ charms, Elfie soon smells a rat, and snaps into full detective mode. Her mundane existence is about to be blown apart. Hitting UK cinemas on April 20, 2012 by Kaleidoscope Entertainment.